Kadıköy is the most colorful district on the Asian side of Istanbul and one of the oldest areas of settlement. With its neighborhoods such as Caddebostan, Fenerbahçe and Moda all worth seeing, here are the 15 things you must do if you find yourself in Kadıkoy. Kadıköy is the most colorful district on the Asian side of Istanbul and one of the oldest settle areas. With its neighborhoods such as Caddebostan, Fenerbahçe and Moda there are things you must not miss if you find yourself in Kadıkoy. Visit the Haydarpaşa Train station, built in 1908 as the first station on the Istanbul-Baghdad railroad, and admire its magical architecture. If you like shopping, check out the many stores on Bağdat Caddesi and Bahariye Caddesi. Check out the historical Kadıköy Çarşı with its fish restaurants, book sellers and gift shops, and visit the Eufemia Church found here. Enjoy a fun day with the children at the Toy Museum in Göztepe, with its collection of over 4,000 toys of many eras .from around the world. Attend a concert or other event in one of the most beautiful historical buildings in Kadıköy, the Süreyya Opera House. Walk along the seashore in Kalamış Park. Eat in the Turkish Balloon Cafe 200 meters above the ground, and enjoy tasty world cuisine and a bird’s eye view of the surrounding district. Drink a coffee on the historical Moda İskele, first constructed in 1916. Watch one of Turkey’s most important and oldest sports clubs, Fenerbahçe, play soccer in their own Şükrü Saraçoğlu Stadium. Visit Kadıköy’s “bar street” (Turkish: Barlar Sokağı) and pass a fun night in one (or a number of) its many great bars and restaurants. See the Surp Takavor Armenian Church, first opened in 1814. Walk around the Kethuda Mosque, built in the time of Süleyman the Great and carrying the distinction of being the oldest mosque in Kadıköy. 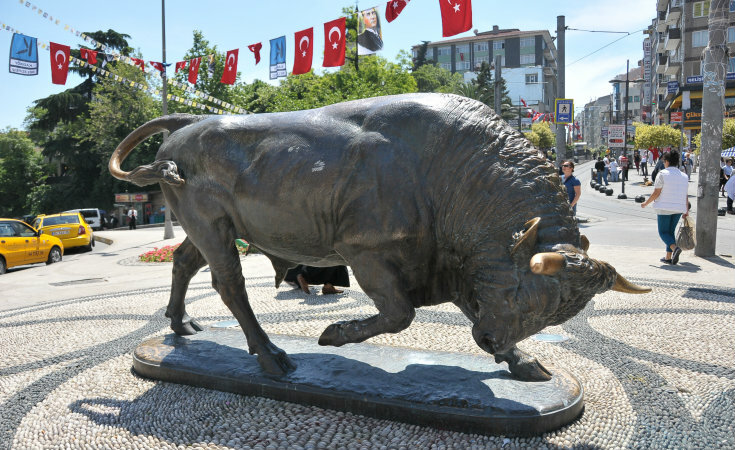 See the Bull Statue, made in Paris and presented as a gift to Enver Paşa by the German Emperor Wilhelm II towards the end of the First World War. Go for a walk on the Caddebostan shore and enjoy a view of the Princes Islands.Take the old tramway from the İskele and enjoy a small tour of the center of Kadıköy and parts of Moda.